Gov. Janet Mills, right, at Monday night's meeting in Farmington on CMP's proposed transmission line. Farmington last night became the latest and largest town to go on record against Central Maine Power’s proposed high-voltage transmission line through western Maine. 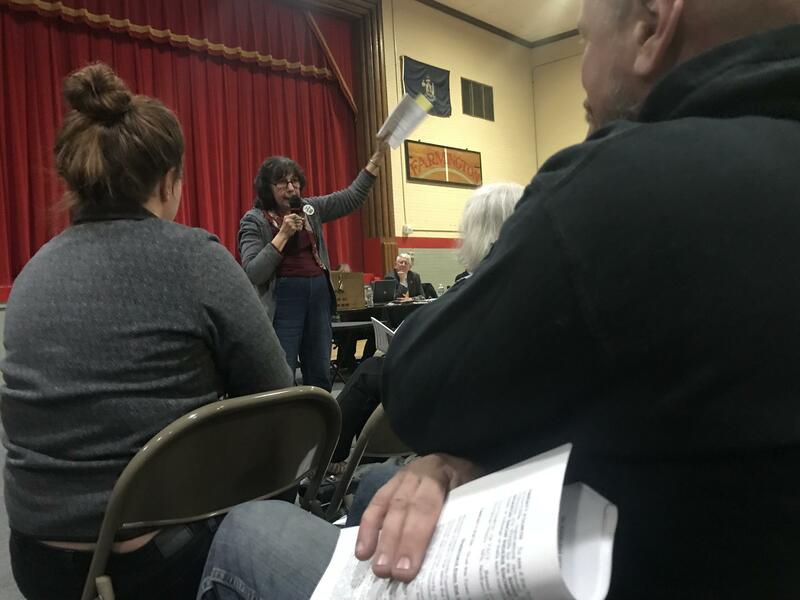 Residents at the annual town meeting voted to require the Board of selectmen to void an earlier letter of support that CMP had sought, and reverse course. The line would follow an existing power corridor in Farmington. But resident Wendy Huish told the audience of more than 300 that she’s spent three decades visiting a backwoods cabin in the Somerset County area where the project would cut a 53-mile swathe through standing forest. She called on listeners to oppose the project for the sake of their children and grandchildren - drawing strong applause. Farmington resident Wendy Huish makes her case against the power line Monday night in Farmington. But there was one heavyweight supporter in the audience to counter her plea – Farmington native Gov. Janet Mills, who owns a home near the community center where the meeting took place. Mills touted a list of incentives CMP has offered, from broadband investment and other economic development incentives to subsidies for energy-efficient heating, and electric vehicles, to scholarships for students at the University of Maine at Farmington. And she said that by helping to bring low-polluting hydro-electricity from Quebec to Massachusetts consumers, the project would reduce emissions that harm human health - and contribute to global warming. Mills received polite applause, but the room seemed bent against the project, and she left before votes were tallied. Ultimately, residents voted 262 to 102 requiring the selectmen to rescind a letter of support previously written to the state Public Utilities Commission, and instead tell the panel that the town is opposed to it.